Over the last several years, the war for talent—especially in the A/E/C industry—has been escalating. And now, winning the battle for the best and brightest talent in a competitive marketplace necessitates new approaches to recruitment and talent acquisition. For years, marketing and human resources (HR) have coexisted in a friendly, but somewhat detached, relationship. Marketing has been focused on helping position their firms for new business, while HR has been focused on attracting and engaging employees. And truthfully, there’s not been much of reason for the two groups to really collaborate. But as firms look to gain a competitive advantage in the recruitment arena, an alignment of these two functions is becoming essential to winning the talent war. So how exactly can A/E/C firms bridge the gap between marketing and HR? Here’s a look at 5 examples. It’s this recognition that should drive firms to consider a close alignment between their culture-building efforts and how they position themselves to potential clients and job candidates. Marketing and HR should work together to ensure that what marketing is saying about the firm is aligned with the realities of the internal culture, employees and infrastructure. Your external brand needs to be an accurate and authentic representation of the firm within, to ensure that it can ultimately deliver on the promises that your brand is making. Along similar lines, HR professionals have been increasingly focused on employer branding initiatives, which aim to position the firm as the employer of choice in their respective markets. Again, close collaboration here is essential for optimum success. The marketing team is in the business of building brands; HR’s employer branding initiatives can be bolstered when they leverage the expertise and talents of the marketing team. Helpful tip: Conduct an audit of both external messaging to potential clients and recruitment messaging to job candidates. Look for misalignment and gaps in the two and seek to ensure authenticity moving forward. While historically recruitment was limited to job boards, career fairs and applicant tracking systems, we live in a new day. Leading firms are realizing that there’s incredible power in building a marketing machine specifically aimed at attracting new employees. If you break it down, attracting and engaging a job candidate is really not much different than attracting and engaging a potential client. It requires the same primary strategic components: a deep understanding of the audience (through buyer personas and journey maps), creation of the right content and a gameplan that leverages the modern marketing (and mostly digital) playbook. Like all effective marketing, a strategic marketing plan is essential and close collaboration with marketing will be required. Undoubtedly, the website plays a huge role in recruitment, specifically for young to mid-career professionals. Marketing can also help HR assess the many new modern marketing tools, tactics and channels available to determine those that are best suited for the firm’s specific needs. Helpful tip: Hold an offsite strategic planning session with key members of the marketing and HR teams as a starting point for creating a marketing machine for recruitment. is a primary influence of employee engagement and in positively contributing to a firm’s culture. However, a recent study from Dynamic Signal and Mindshare revealed that 74% of employees feel that they’re missing out on at least some company information and news. Today’s HR teams undoubtedly wear a lot of hats and can’t be expected to be experts at everything—communication included. One of the primary roles that marketing plays is that of communications—with prospects, clients, partners, media and influencers—and internal audiences shouldn’t be the exception. By working together, HR can bolster their internal communications by leveraging marketing’s expertise. Company emails, events, surveys and the Intranet website can all be strengthened by a collaboration with the marketing team. Helpful tip: Treat your internal audience the same way you would your external audience. 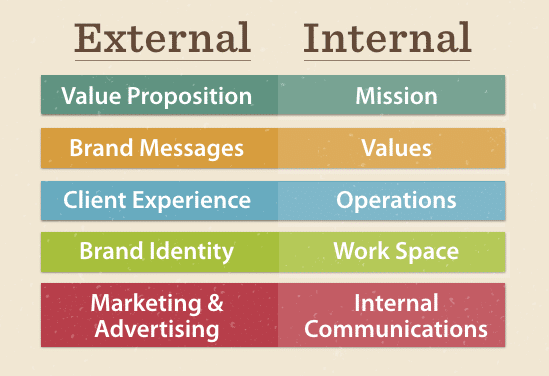 Internal communications should be included in your firm’s marketing plan and marketing should track KPIs based on questionnaires, intranet metrics, and other communications efforts. Needless to say, your firm’s employees (and their personal social networks and connections) represent an untapped resource for social amplification. In fact, employee advocacy can result in a 5x increase in web traffic and 25% more leads. Add to that, research from Gartner found that employee advocacy programs not only amplify social marketing and sales efforts but can also improve employee engagement. Starting to see a pattern emerge? A collaboration of marketing and HR can better accomplish marketing goals AND firm-wide goals at the same time. Helpful tip: Consider leveraging a social media advocacy tool such as Oktopost or Dynamic Signal to manage (and track) your firm’s employee advocacy efforts. Harry Beckwith, author of the classic B2B book Selling the Invisible makes the point that marketing is not a department, it is your business. While it is true that not everyone is actually a marketer, I think Beckwith’s sentiment makes a point that’s worth considering. While not everyone has the job of being a marketer, every employee can play some kind of role in helping to market the firm. Similar to how a firm’s employees can provide amplification of a firm’s content and social media efforts, there is immense value in developing a marketing mindset among your firm’s employees. So how can you create a firm-wide marketing mindset? It can start as easily as collaborating with HR to include marketing in your firm’s onboarding and staff development training programs. New and existing employees should be in the know about what marketing is doing to position the firm for growth. Other important training opportunities might be related to brand standards or guidelines for social media advocacy (see #4). You can also regularly host lunch and learns and other informal meetings to share growing trends and modern best practices that are shaping the firm’s marketing strategy. The point is, marketing can and should be considered one of the many important required “subjects” included by HR in the corporate training program. Helpful tip: Consider hosting an annual “state of marketing” meeting with key internal stakeholders to communicate activities and results of the past and plans for the future. These five examples are just some of the many ways that marketing and HR departments in A/E/C firms of all shapes and sizes can work together to win the talent war. Better alignment of these two unlikely allies will result in a positive impact on your firm’s brand, employees, culture and bottom line. This article was originally posted in Business 2 Community.